What does working in a vineyard have to do with dependence on God? When I was 25 years old I joined a kibbutz in Israel’s Negev desert. In these communal settlements in Israel, backpackers volunteered to work, often outdoors, in exchange for food and accommodation. I was a vinedresser in a vineyard during pruning season. I spent hours each day on my haunches, back arched uncomfortably, fingers catching on sharp branches until my skin tore, clipping row after row of vines. It was painful work. The spiritual symbolism of my work was lost on me at the time, but reading Jesus’ words to His disciples on the night before His death puts me back in that vineyard. “I am the vine; you are the branches. If you remain in Me and I in you, you will bear much fruit; apart from Me you can do nothing” (John 15:5, New International Version). These verses, and the memories they evoke, point me toward the heart of my struggle to follow Christ, and to the heart of the Master Vinedresser. WHY ARE WE BEING SO HARD ON THE BRANCHES? Inexperienced vinedressers often fail to prune aggressively enough. Convinced they’re sparing the vine, they end up damaging its fruitfulness instead. “You need to clip more, you’re being too gentle,” the Bedouin Arab shouted at me as he watched my clumsy attempts at pruning. “It looks that way, doesn’t it?” he replied. I was clueless about how best to tend the vines. But I pruned each branch to within an inch of its life, trusting the counterintuitive technique of those who knew how to nurture vineyards. Frequently I don’t know what’s best for my own growth either. But God does. 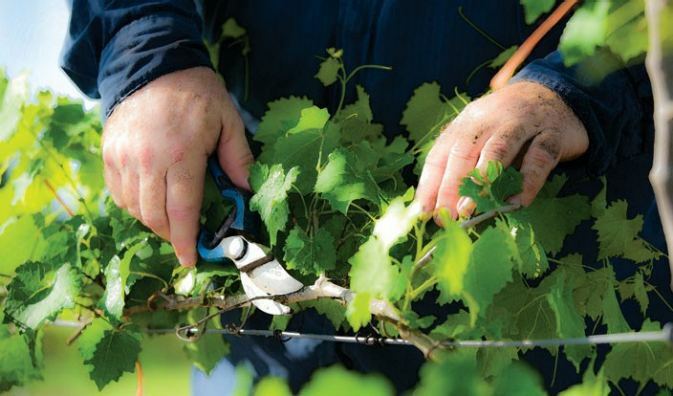 The Good Vinedresser knows His vines, His branches and the conditions they’re growing in. He knows what they need and when. I felt we were being cruel to the branches. In the same way, Christians frequently confuse pruning with punishment. Growing as believers is meant to be good, not just feel good. But perhaps we expect punishment from God, either because we see Him as a harsh master, or see ourselves as dead wood, deserving to be thrown away and burned. When we sin, there are natural consequences. When I lie to someone, for example, the trust between us is damaged. But pruning is about increasing our fruitfulness, keeping us growing into the likeness of Jesus, not punishing our transgressions. As a writer I entrust my work to an editor who helps me recognize elements to cut out, but also highlights what needs bringing out more strongly, so the message becomes clearer. It doesn’t always feel nice, but I trust the intentions of the editor and believe the process is for my benefit. Likewise, God is intent on me being fruitful, so He draws my attention to whatever might inhibit that, offering me deeper awareness of my motives and patterns of thought or behavior. He doesn’t delight in causing me discomfort. He’s just more committed to my growth than I am. WHY DIDN’T I COME DURING HARVEST TIME? I was so frustrated. Pruning was laborious work, painful for the branches and for me. The fruit wouldn’t come until long after I left the vineyard. I envied those who would see it. In reality, though, without pruning, there would be no fruit to gather. Fruitfulness refers to the work only God can do within us. We tend to confuse it with being effective in our labor for Him. We focus excessively on our output, because we want to be judged according to our effort, not our ability to remain dependent on someone else’s finished work. A fruitful Christian isn’t simply someone committed to personal evangelism, seeing people coming to Christ. God defines the fruit He’s producing in us in Galatians 5:22,23: love, joy, peace, patience, kindness, goodness, faithfulness, gentleness and self-control. As we increasingly manifest these characteristics, those of Christ Himself, people will be drawn to God. People are more attracted to those who are more like Christ. But this is the work of the Holy Spirit in us; our part is to submit to His methods, to place ourselves in His hands. WHY CAN’T I MAKE MYSELF GROW? I wasn’t a Christian when I left my job as an advertising executive in London and travelled to Israel. It was more of a prison break than a pilgrimage. But I failed to foresee that Israel might be a bad location for avoiding God. The journey that took me to the kibbutz was a desperate search to become more than I thought I was. I wanted to live a life worthy of a novel, but feared I was a dull, short story. I knew who God was, but chose to branch out from Him and seek satisfaction in other places. It didn’t work. “Apart from me you can do nothing,” says Jesus (John 15:5, NIV, emphasis mine). This verse is explosive. I need to be reminded of it daily. People who don’t follow Christ still live good lives, pursue careers, have families and leave legacies. But we were made to become more and more like Jesus, and that’s utterly impossible without leaning into God. Spirit-filled living involves believing He will grow us into who we’re meant to be, and trusting that the fruit will come. This is backbreaking work, just like my time in the vineyard. It’s a struggle to decide who’s in charge of our lives: the Master Vinedresser, or just us. I was in Israel searching for what only God could offer—fulfillment, purpose and peace. But I couldn’t find them apart from Him. I could not be my own vine. Since becoming a Christian, I’ve also tried branching out from God. I’ve tried reading more, praying more, trying harder not to sin. These things are good, but can also become ways to live according to my own effort. Christian discipleship is not a workout, or a self-help program. The branch is designed to be directed by the vine, not the other way around. When Christians believe they can grow without radical submission to God, the source and director of life, they sacrifice the intimate relationship He promises and are left with nothing but rules and rituals. God invites us to be honest about our weakness and call upon His strength. In Him alone lies the power to change.